Experiencing some problems with connecting your camera/microphone? Getting the black/white screen instead of your camera image? We've prepared a list of basic troubleshoots for you to go through and get the issue fixed! If you're getting a black/white screen, there may be software that uses your camera at the same time or in the background, and it block's our access to the camera. These simple actions can help you with fixing a whole row of glitches: freezings, delays, black screen, etc. Temporary files like internet history, cookies, and cache take up a ton of space on your hard disc. Deleting them frees up the valuable space and speeds up your computer. Restarting computer refreshes the memory and prompts essential tools to run maintenance on it. When you leave your computer on, background programs and apps hog its memory, so rebooting will surely speed up your computer/laptop. 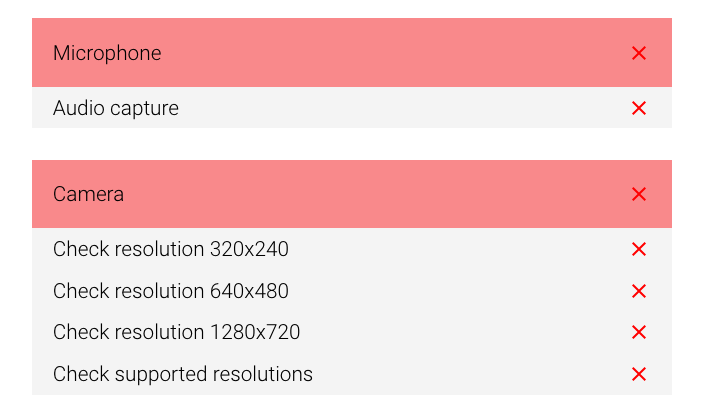 If everything is marked with red, probably there is an issue with your camera/mic OR Chrome has problems with accessing it. In the first case, please check your devices or try with another one. If it's an external camera/mic, try plugging it out/in. Updating can be a drag, but it's definitely worth doing it: new updates fix bugs and glitches that slow down your computer. BTW, when connecting your camera, the following window can pop up. Do not hesitate to press "Allow" so that BeLive has access to your camera/mic! In case you cannot access your camera/mic or start the broadcast, try creating a broadcast in an incognito window. If it works there, there is a Chrome extension that blocks your camera access – disable the extensions one by one in the regular window to find which one affects your camera. For Windows you can check the detailed instruction here. Echo is caused when one person's voice is heard through another person's microphone. We recommend for the host and guests to wear a headset, to avoid the sound from reaching the microphone. A good rule to remember: If you hear the echo, then it's NOT coming from your system. The person causing the echo DOES NOT hear the echo. If you still have any questions, feel free to text us in a chat window!